My Comments: Remember those frantic days right after the PPACA was passed? How soon would we see death panels? Could Grandma survive? The world would end very soon. In my writings, I’ve argued there are five primary stakeholders in the health delivery system here in these United States. 1. Insurance companies; 2. pharmaceutical companies; 3. the hospital industry; 4. physicians; and 5. patients (you and I). I argued that the alternative to acceptance of the PPACA was to cede the future of healthcare to the two of these five that would most likely prevail in making the rules for the rest of us to live by if the PPACA didn’t survive. God help us if the two winners turned out to be insurance companies and big pharma. Or insurance companies and hospitals. Talk about death panels. 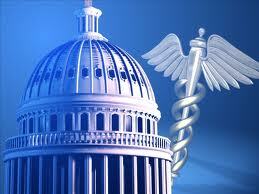 Last week the Supreme Court once again upheld key elements of the PPACA. Today, in the Gainesville Sun is a letter from a health care attorney suggesting that with the consolidation of insurance companies, we are inexorably moving toward a Medicare for all system, run and administered by ultimately perhaps three major insurance companies, subject to the framework imposed by the PPACA. I still fail to understand why the GOP considers this a threat to the survival of the Republic. Health care for everyone, with corporate America intimately involved with the whole system, with help for those who cannot afford it from the government. A healthier workforce, better health outcomes, more opportunities for economic growth (and profits) and less stress for people like you and me. How is this different from the interstate highway system, brought to you by the Republican Party back in the 1950’s? Built by private companies, and maintained by the government. That’s from a Wall Street publication whose editorial writers have rarely missed an opportunity to bash the health care reform law. Here are a few other headlines, these from IBD’s editorial page, just since the first of this year. It wouldn’t surprise me if UnitedHealth Group executives helped shape the opinions of those editorial writers during the reform debate. One of the things I did in my old job as head of PR for one of the country’s other big for profit-insurers was arranging for my CEO to have “desk side chats” with bigwigs at important publications like Investor’s Business Daily. We would often leave those meetings with an invitation to submit an op-ed, as was the case several years ago when Ed Hanway, Cigna’s CEO at the time, and I visited with then Dow Jones CEO Peter Kann and Daniel Henninger, deputy editor of The Wall Street Journal editorial page. The CEOs of the largest for-profit health insurance corporations were very wary of Obamacare as it was being drafted on Capitol Hill. They didn’t really say so publicly—in fact they had their chief lobbyist, America’s Health Insurance Plans’ Karen Ignagni—claim to support reform. “You have our commitment to play, to contribute, and to help pass health care reform this year,” Ignagni told President Obama during a March 5, 2009, meeting at the White House. But insurers were playing a duplicitous game. Later that year, Ignagni’s group began secretly funneling tens of millions of dollars to allies like the U.S. Chamber of Commerce to finance anti-Obamacare PR and ad campaigns. The big for-profit insurers, which gave AHIP the lion’s share of the secret money, arguably are more responsible than any other special interest in turning the public’s attitudes against reform. Although the insurers stood to gain financially from a law that would require Americans to buy coverage from them, many Wall Street financial analysts and investors worried that some provisions of the law might cut into insurers’ profit margins. Analysts and investors in particular didn’t like the section of the law that would require insurers to spend at least 80 percent of their premium revenues on health care. Before the law, many insurers routinely spent 60 percent or less of their revenues on patient care. The less spent on care, the more available to reward shareholders. Wall Street also didn’t like the provision that would have created a government-run public option to compete with commercial insurers, and they didn’t think the penalties on Americans who refused to buy coverage were harsh enough. Partly because of the anti-reform advertising blitz insurers financed in late 2009 and early 2010, Congress capitulated and gave up on the public option. And lawmakers agreed to make the penalty for not buying insurance more painful with every passing year. But despite the worry, it turns out that the law the insurance industry’s shills demonized has been awfully good to insurance company investors. UnitedHealth Group’s revenues grew an eye-popping 13 percent, from $31.7 billion in the first quarter of 2014 to $35.8 billion in the first quarter of 2015. Net earnings on a per share basis were even more impressive, growing 33 percent, from $1.10 to $1.46 per share. One reasons for the glowing results was the fact that UnitedHealth added 570,000 new customers during the first quarter of 2015 from the Obamacare exchanges. And contrary to conventional wisdom, that the formerly uninsured Obamacare customers would overuse medical services, UnitedHealth executives said that wasn’t the case. In fact, the company’s CEO, Stephen J. Hemsley, said that even with the new Obamacare enrollees, the company “improved” its medical loss ratio, which measures the percent of revenues spent on medical care, from 82.5 to 81.1 percent. He used the word “improved” because, as I noted, Wall Street loves it when insurers spend less on medical care. That decrease was viewed as a very positive development by investors. By the end of Thursday, they had bid up the company’s share price by 3.6 percent, to $121.60, just shy of the all-time high of $123.76 set on March 30. I can’t wait to see how IBD’s editorial writers spin UnitedHealth’s Obamacare success. I’ll let you know if and when they weigh in. But don’t hold your breath. The Chief Justice’s Dissent is Heartless.